"Inspiration Can Come From Anywhere." Described as an "evolving science" that fixates on "nature for answers to modern problems in unexpected ways," we discover the way that long before science was a pursued course of study, nature-- or more precisely evolution-- served as the "ultimate inventor." Having not only "solved all of life's problems," over the course the 4 billion-year history of our planet, this Emmy and multiple award winning series further explains that "many of man's most-clever engineering solutions have exact counterparts in nature." Broken up into three parts, the DVD begins with Energy is Key, which gives us an overview of the way we've used energy over the course of history from the Bronze Age up through the Industrial Age-- perhaps without comprehending (as we now know) the astronomical cost that it's had on Earth. 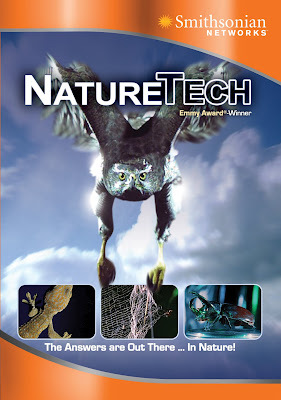 Introducing us to the concept of biomimetics which has flourished in the wake of the dubbed "Information Revolution," we're given an insider's view of the way that nature has kept us moving forward. Featuring a refresher on the basics of photosynthesis, Energy is Key also boasts a particularly fascinating segment on the Gemini House in Austria as we learn more about the costly solar panels which rotate with the sun as though they were leaves until the documentary breaks it down even further by analyzing the wonders of leaves themselves and the chemicals and membranes therein. Spending some time discussing the hybrid car and hydrogen fuel cell debate and the double-edged sword of needing to cause pollution to make pollution-free cars, the episode soon moves unexpectedly into the realm of termite colonies and the way that the intricate ventilated clay mounds with constant temperature have inspired builders to look for energy efficient methods in their own construction. In the Emmy award winning Magic of Motion (which received an honor for its breathtaking cinematography), we go way back in time to study the evolution of movement and the way that legs, wings, and fins have inspired us in the realm of cars, bikes, and planes as we're advised to "look again" at the impact that researching a bird's "lift-off" led to gliding which ultimately evolved into airplane travel. A rich and involving episode filled with scientific history that's affected the lives of all inhabitants, Magic of Motion is a particular standout in a series of superlative documentaries that come highly recommended for school libraries and/or supplemental scientific education for interested or home-schooled students (and also earned the series a Gold Parent's Choice Foundation Award). Additionally, it leads into a thought-provoking analysis of design in The Material World that begins by introducing us to greenhouse history and London's "Crystal Palace," to again inspiring us with the idea that leaves can support enormous weight as the scientists blend the study of the natural world with that of the human body, using human femur inspired structure from our skeletons to erect tall buildings and landmarks such as the Eiffel Tower. A fascinating subject that's captured in an energetically creative way filled with candid nature footage that's sure to appeal to students, Nature Tech makes suitable viewing for all ages but would be of particular benefit to those at the level of middle school or above to fully absorb the vast knowledge offered up by the filmmakers that will no doubt play better on additional viewings, not to mention would be augmented by an interactive classroom curriculum and further study. As someone who was always intrigued by science yet didn't excel in the subject or pursue it as much as I would've liked, it's a great and incredibly timely look at the state of our planet and features an admirable approach to use creative thinking and problem solving from the natural world to resolve conflicts that have been created by men. A celebration of evolution and the rich and incredibly complex ways plants, animals, and humans have changed over the years-- with the underlying theme that there is more to every living thing than one can possibly begin to understand (as you'll never look at a leaf in precisely the same way again)-- Infinity Entertainment Group and Smithsonian Networks' acclaimed program hits DVD retail markets like Amazon on January 13, 2009.